The next generation CR9000, the CR9000X, will be available first quarter, 2004. The CR9000X will be based around the new CR9032 CPU module. Increased clock speed and 128 Mbytes of internal SDRAM result in improved performance. Our preliminary tests show a reduction of processing time up to 25 times in some applications as compared to the previous CPU. 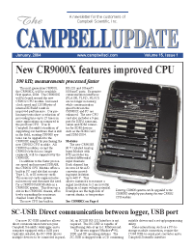 True to Campbell Scientific's tradition of supporting our hardware that is still in the field, existing CR9000 systems can be upgraded to the CR9000X simply by purchasing the new CR9032 CPU module. All CR9000 modules, except the CR9080 (which is no longer required), will be supported by the CR9000X. In addition to the faster processor speed and increased SDRAM, the CR9032 CPU Module offers a built-in PC card slot that accepts Type I, II, or III memory cards. The memory cards augment internal memory and eliminate the need for a CR9080 PAM Module in a CR9000X system. This frees up a slot in the CR9000X chassis, effectively expanding the maximum channel count of the system. The new CPU has built-in RS-232 and 10baseT/ 100baseT ports. Expensive communication interfaces (PLA100, TL925, NL105) are no longer necessary, while communication speed between the CR9000X and PC are enhanced. The new CPU card also includes a 9-pin port for DSP4 communication and SDM connector for SDM devices such as the SDM-CAN and SDM-SIO4. The new CR9058E 60 V Isolated Analog Input Module with RTD provides ten isolated differential input channels. Each channel has its own 24 bit A/D converter providing input isolation up to ±60 V. This allows customers to measure a signal (resolution to 2 microvolts) riding on a larger voltage potential. Examples are the high side of current shunts, or temperature measurements of battery posts and alternator brushes. The CR9058E is based on a programmable DSP that implements a fifth-order sync filter. This reduces signal noise, eliminating the need for third-party filter devices. We are developing a new Anti- Alias Filter and Spectrum Analyzer Module based on the existing CR9052 electronics and a new excitation daughter board. The CR9052IEPE provides excitation and signal conditioning for IEPE-type (Integral Electronic Piezo Electric) accelerometers, microphones, and pressure transducers. The CR9052DC offered DC excitation only, although it was designed to accept daughter boards for different excitation options. An existing CR9052DC can be converted to a CR9052IEPE by ordering a conversion kit that includes a cover fitted with BNC connectors. With the removal of a few screws, the user can swap back and forth between the DC and IEPE excitation boards. The CR9058E and CR9052IEPE can be used with previously purchased modules in either a CR9000 or CR9000X system. PC9000 version 5.0 will support the new CR9000X hardware. PC9000's communications, program generation, and real-time windows have been enhanced. In fact, most real-time windows have updated controls and high-performance graphics. We offer LoggerNetSDK for customers who need to program a custom interface to our dataloggers. Multiple connections, networking capability, and telecommunications functions are supported in the LoggerNetSDK tool set.